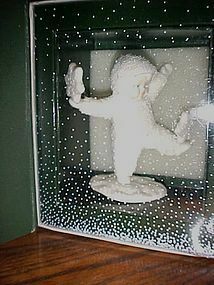 Dept 56 Snowbabies figurine in box "It's Smowing"
Snowbabies Collection is the It's Snowing figurine. This piece is item #68821. This piece was issued in 1996 and retired in 2001. It is in mint condition in the original box with the snowbabies story. The box may have some shelf wear. Adorable snowbabies figurine with stars in hand, one on the toe, and another in his back pocket. PERFECT!! 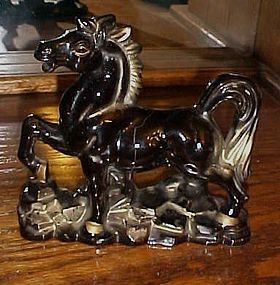 Vintage 40's-50's black prancing horse with gold decoration. Made of red clay pottery. Measures 6" tall and is about 6 1/2" long. No sticker or name. No chips or cracks. Some wear to the gold on the rocks below him. Nothing distracting from the figurine. Antique metal pin up lamp is hand painted white with blue flowers. Works good. 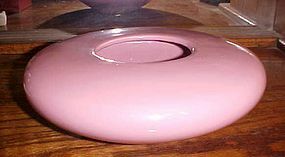 7 1/4" x 3 1/4" oval shape. Minor chips to the paint. Nice shabby chic look. No name, just a pat number. Vintage Child's china soup tureen with attached underplate. 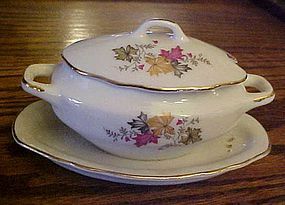 Decorated with fall color maple leaves on a white tureen with gold trim. Excellent condition with no damages. Maker is Royal Crown 11/446. Paper Japan sticker too. Measures 5 3/4" long x 3 1/2" deep. Pretty ! 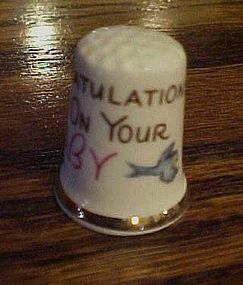 Finsbury Fine Bone China Thimble. Made in England 1" tall. Says "Congratulations on your Baby" and has a little blue bird, and accented with gold trim. Inside reads: Finsbury Fine Bone China. Made in England Excellent condition. I have 5 available. Price is per thimble. A great gift. 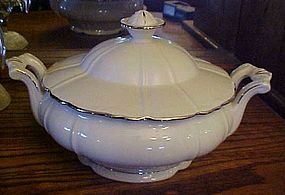 Beautiful covered casserole with platinum trim. Made of fine Bohemian china made in Czechoslovakia, Pristine condition with no wear. Elegant and will go well with any white china. 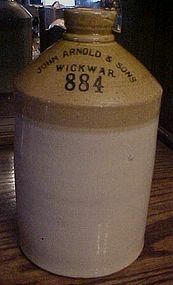 Measures about 6" to the top of the knob on the lid. Handle to handle measures 11". 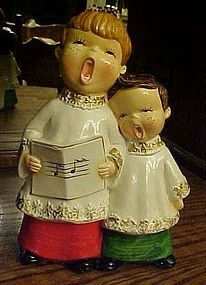 Adorable hand painted plaster or chalk like figurine of two choir boys. They are singing their little hearts out. 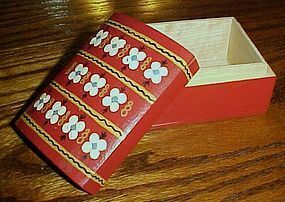 Musical box on the back, but is wound too tight (back does come off with screws, but has never been removed yet). You may be able to fix it. 8 1/4" tall. Great vintage condition with no paint loss or noticeable damages. Lovely RARE HOCKING AMBER BOOPIE GLASS 4 oz GOBLET from the 1950's. Rich Amber - Gold color bowl with clear foot and stem base surrounded with bubbles. These hold aprox. 4oz of your favorite beverage. Aprox. 3.5" tall, top rim aprox, 3.75" in diameter, base aprox. 2.5" in diameter. Fantastic condition with not the slightest wear or flaw. I just have two right now. Price is for each. Vintage LEFTON NO. 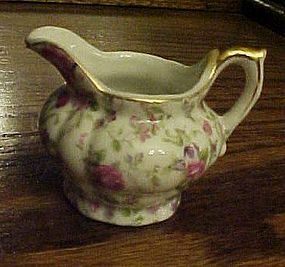 7245 small demmitasse or childs size creamer in the ROSE CHINTZ PATTERN with gold accent trim on edges and handle. 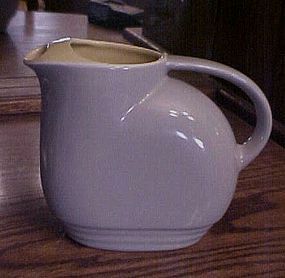 Creamer measures 2 1/2" TALL, 3 1/4" from Spout to Handle. Gold Lefton stamp. Excellent, NO CRACKS CHIPS ETC. 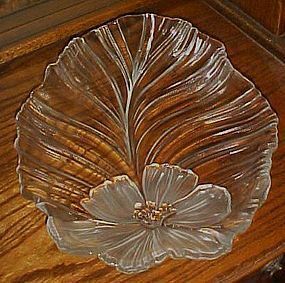 Mikasa Crystal Hibiscus Frost glass Platter. 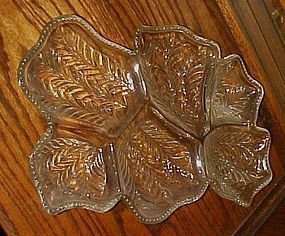 Beautiful large leaf shaped platter by Mikasa made of heavy glass. It is approximately 17.5" long and 12” Wide. Beautiful clear glass with a frosted floral hibiscus flower. Perfect as a seafood platter, Cheese & Cracker,appetizer or Dessert platter. Great platter for any occasion. This is used but like brand new. In excellent condition, no chips or cracks. Item is heavy , so please provide zip code so I can calculate shipping. 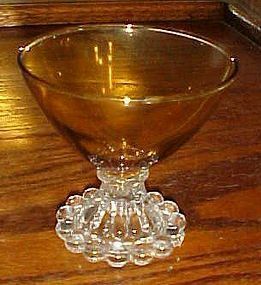 Jeanette Glass Venetian six section serving dish in clear or crystal color. 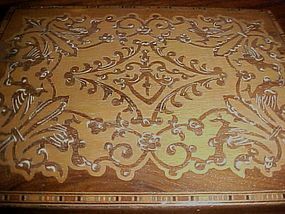 Tray is in excellent condition, no chips, cracks, or breaks. Era is late 50's. Dish measures approx 16 1/2" long x 10 1/2" wide. 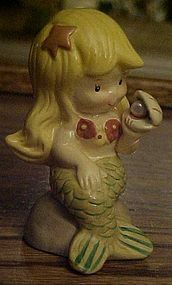 Sweet little mermaid sits upon a rock and gazes at the pretty pearl inside her oyster.. Measures 3" tall and is in perfect condition.